Kick dull dinners to the curb and bring home a touch of heat... without the spice! Our Skillet Meal: Pork with Roasted Peppers is the perfect way to put a southwestern favorite on every plate. If you have a skillet and 15 minutes to spare, you already have everything you need. This flavor-packed recipe starts with premium pork - perfectly seasoned and cut into meaty portions - then mixes with a colorful blend of fire roasted tomatoes, green and poblano chilies, red peppers, corn, tomatillos, and onions. All of it sautés together in a southwest-inspired blend of chipotle pepper, smoky paprika, garlic, lime, and ancho chilies for a heaping helping of zest. And there's no need to sweat, it's not spicy! 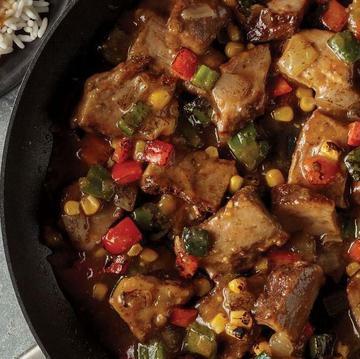 Served on a bed of long grain rice, our all-in-one Pork with Roasted Peppers is guaranteed to be everything your weeknight dinners have been missing. FOR FOOD SAFETY AND QUALITY, FOLLOW THESE COOKING INSTRUCTIONS. FOOD MUST BE COOKED TO AN INTERNAL TEMPERATURE OF 165°F AS INDICATED BY A FOOD THERMOMETER. Do Not Thaw. Keep Frozen Until Ready To Use. Appliances vary, adjust cook time accordingly. Stove Top: Carefully open bag and remove 2 sauce pouches and the rice pouch. Begin thawing sauce pouches in bowl of HOT water while preparing meal. Heat 10-inch NONSTICK skillet on stove top over medium-high heat. Add 1 tablespoon oil and remaining contents of bag to skillet. Cover and cook 5 minutes, stirring occasionally. Microwave rice pouch on HIGH for 3 minutes. Add thawed sauce to skillet and stir. Cover and cook 2 minutes stirring occasionally. When sauce is hot and bubbling, remove skillet from heat. Cover; let stand 2 minutes before serving. Carefully remove rice pouch from the microwave, open and pour into serving dish. Pour contents of skillet over rice and serve. Ingredients: COOKED LONG GRAIN WHITE RICE, COOKED SEASONED BRAISED PORK (PORK, PORK BROTH, CORN STARCH, SALT, FLAVORING [YEAST EXTRACT, CITRUS EXTRACT], CARAMEL COLOR, ONION JUICE, GARLIC JUICE, SPICE EXTRACTIVES), WATER, TOMATILLOS (TOMATILLOS, CITRIC ACID), FIRE ROASTED GREEN PEPPERS, CORN, RED PEPPERS, POBLANO PEPPERS, ONIONS, CHICKEN STOCK BASE (CHICKEN STOCK, CHICKEN FLAVOR, SEA SALT, YEAST EXTRACT, CHICKEN FAT, GARLIC POWDER, VEGETABLE STOCK [CARROT, CELERY, ONION], BAY, THYME, MARJORAM, CARROT POWDER), GREEN CHILES, FIRE ROASTED TOMATOES (TOMATOES, TOMATO JUICE, SALT, CITRIC ACID, YEAST EXTRACT, CALCIUM CHLORIDE, NATURAL FLAVOR, ONION JUICE, GARLIC POWDER, ONION POWDER), SPICES, GARLIC PUREE, CANOLA OIL, SALT, CORN STARCH, CHILI VERDE SEASONING (SPICES INCLUDING GREEN CHILI PEPPER, SALT, SUGAR, DEHYDRATED ONION & GARLIC, DEHYDRATED BELL PEPPER, DEHYDRATED TOMATO, NATURAL FLAVORS, CITRIC ACID AND LESS THAN 2% SOYBEAN OIL & SILICON DIOXIDE ADDED TO PREVENT CAKING), LIME JUICE CONCENTRATE, DRIED ANCHO CHILES.